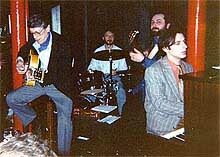 Lev Kushnir appeared on Moscow jazz scene in 1986 and immediatly became popular among jazzmen and fans. In 1988 he graduated from the jazz faculty of the Gnesins' Musical Academy. He studied with a famous Russian pianist Michael Okun. Lev's romantic and expressive manner is inspired by Keith Jarrett, Chick Corea and Herbie Hancock. His deep understanding of harmony and swing together with his brilliant improvisations have made him one of the leading Russian jazz pianists. 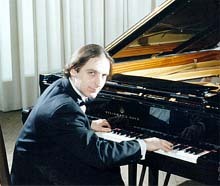 Lev started his career in the Moscow All Stars ensemble led by Vladimir Konovaltsev. Then he worked with German Lukianov's group "Cadence", Two year experience of playing with the group includes countless tours around the country and in Europe, festivals, recordings and participating in Dizzy Gillespie's show in Moscow. Since 1990, Lev Kushnir has been living as a freelance musician and has been playing with different groups along the most outstanding Russian jazzmen such as German Lukianov, Nikolay Panov, Victor Dvoskin, Alexander Rostotsky, Sergei Gurbeloshvili, Alexey Kuznetsov, George Garanian, Boris Kozlov. He also played behind some western musicians: Bill Skeat from Great Britain, Jos Moons and Phil Abraham from Belgium and a living legend of American jazz, guitarist Tal Farlow. His background as a sideman includes several LPs for "Melodia" label and "Live at Grenoble Jazz Festival" for the Thelonious label with the Victor Dvoskin Quartet. Lev is deeply involved into the jazz life of Russia and Europe. He is frequently touring all over his native country, republics of the former USSR, France, Belgium, Finland, Sweden, England, Germany, Holland, Bulgaria. Lev Kushnir appeared on such a great festivals as Pori, Kaiani and Imatra in Finland, Skovde in Sweden, Rosenheim in Germany, Ivrea in Italy, to mention just a few. 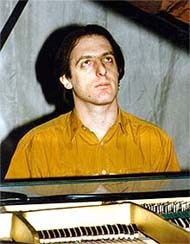 According to the 1991 Russian critics poll, Lev deserved a recognition as a best young musician of the year and became one of the five best pianists of the country. Audio: In 1994, Lev's solo CD "Flying Dutchman" has been released in Moscow.